How to convert AVCHD in .mts, .m2t, .m2ts to Apple Prores 422 on Mac or Windows? Follow this guide, and then it is easy to import AVCHD to FCP, FCP X, AMC and etc. Convert AVCHD to ProRes for Easily Importing AVCHD to Final Cut Pro, FCP X, Avid Media Composer! AVCHD (Advanced Video Coding High Definition), often with the file extension of mts, m2ts or mt2, is a professional digital recording format for Sony, Panasonic, Canon and more camcorders and cameras. Though Final Cut Pro announced to support AVCHD video files, some AVCHD files still can not imported to FCP: AVCHD support is available only on Intel-based Macintosh computers; FCP only supports AVCHD camcorders typically connect to computers via USB 2.0, not FireWire; DVD-based AVCHD camcorders are not currently supported by FCP; Standard definition video recorded with AVCHD camcorders cannot be accessed in Final Cut Pro. In order to import all kinds of AVCHD to FCP successfully, it is better to convert AVCHD to Apple ProRes 422 which works well with all versions of Final Cut Pro. If you are Windows user, and want to get ProRes codec video on Windows, please free download the Windows ProRes Converter. The following article just aims to provide a step by step guide on how to convert AVCHD to ProRes with almost no loss of video and audio quality. Convert and import all kinds of AVCHD including DVD-based AVCHD, high definition AVCHD, standard definition AVCHD to Final Cut Pro HD/6.0/7/X no matter the Mac is Intel-based or not and not matter the AVCHD camcorder is USB connected or by via of FireWire. Convert AVCHD with the file extension of .mts to ProRes422/4444, .mt2s to Propes 4444/422, .mt2s to Propes 4444/422. Convert AVCHD in 1080-line 50-frame/s and 60-frame/s modes (AVCHD Progressive) and stereoscopic video (AVCHD 3D) to ProRes. Convert AVCHD videos recorded from Sony HXR-NX5U/HDR-AX2000/HDR-SR10/ HDR-XR105E/HDR-CX560/DCR-DVD908E/DCR-SR60E/DCR-SR82E/DCR-SR300E to Apple ProRes. Convert AVCHD to Apple ProRes from Panasonic DMC-GH2/Panasonic AF-100/Panasonic HDC-SD900/AG-HSC1UP/HDC-TM900/HDC-HS900/Lumix DMC. Convert AVCHD to ProRes from Canon Vixia HF/HF10/HF100/HFS200/HFS10/HG10/HG-21. Convert JVC Everio GZ-HD320/GZ-HM400/HDD/GY-HM100U AVCDH to ProRes. Free download this professional AVCHD to ProRes 422 Converter – Acrok ProRes Converter, install and fire up. Copy AVCHD video from the AVCHD camcorder or camera to Mac, then click “Add File” button to load AVCHD video file to Acrok ProRes Converter. Tips: This powerful MTS to ProRes Converter also support drag-and-drop function, so you can also simply drag the copied AVCHD file to the main intercface of this software. Click the small triangle to the right of “Profile“, a drop down menu will pop up, select ProRes Video (*.mov) from the “Final Cut Pro” as output video format. Then click “Setting” button, the “Advanced Settings” Window will pop up right beside the main window. In the “Advanced Settings” Window, click “Advanced” tab, and then go to “Video” column, click “ProRes 422” tab on the right side of Profile. Change the ProRes Presents by choosing from the drop-down list. 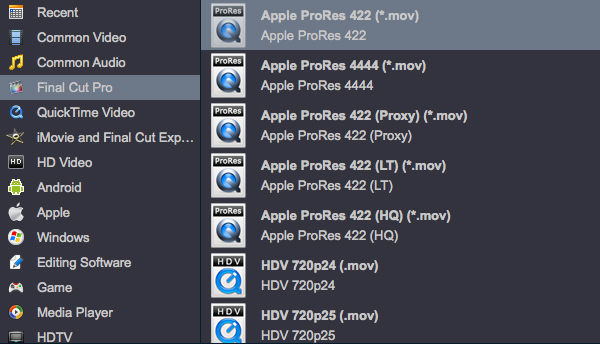 There are 5 options including ProRes 422 Proxy, ProRes 422 LT, ProRes 422, ProRes 422 HQ, and ProRes 4444. Click “Convert” button to start the AVCHD to ProRes conversion, it will fast convert AVCHD in M2TS, M2T or MTS to Apple ProRes. Wait no more, just follow the above step by step guide to convert AVCHD to ProRes 422. Then it is just easy to import the converted AVCHD whatever from Sony, Panasonic, Canon or JVC to Final Cut Pro.